Track bicycles have no brakes and only one gear. The gear is “fixed” and so doesn’t allow the rider to “freewheel” or coast. Riders apply backward pressure to the pedals to slow the bike. The size or development of the gear may be changed according to the rider’s ability or the type of event. Since the track surface is very smooth, tires can weigh from 4-8 oz and can be inflated to very high pressures – often as high as 180 psi. 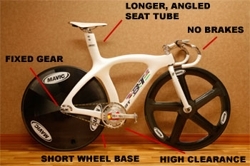 This enhances a track bicycle’s speed well beyond a typical road bike. There many different types of races in track cycling. Here are the details about each event type and what to look for in each race. The most fundamental race in the velodrome. All riders start at the same place (on scratch). The rider that crosses the finish line first on the final lap wins. Scratch races vary in length from 8 laps and up, and are typically the first event of the evening. What to watch for: Look for riders to work together to distance themselves from the pack while their allies try to keep the pack from chasing. Watch for tactical maneuvering for the final sprint at the finish. A scratch race in which the number of laps is known only by the chief official. Riders try to second guess the official as to when the race will finish. The gun is fired at 1 1/2 laps from the finish to signal the distance is about to be completed. What to watch for: Look for riders to “take a flyer” with the gamble that the race will end while they are away from the pack or that they can get themselves into the proper position from which to sprint, at the time the race nears its end. It’s anybody’s guess! A two lap “drag race” to the finish line from a standing start. Riders qualify to race in a final by competing in preliminary heats of 6-8 riders. Chariot races are the fastest races in the Velodrome. What to watch for: Some riders like to ride from the front, while others prefer to draft off the rider in front and then come around on the last lap. The points race may seem confusing at first glance, but it can be one of the most fun events to watch. Essentially, riders cover distances of 10-40 km, and the rider who accumulates the most points, wins the race. Points are awarded during sprints every 8-10 laps. The first four finishers in these sprints are awarded 5,3,2 and 1 points respectively. Points are doubled on the final sprint. If a rider laps the field, he or she is awarded 20 points. Any rider that loses a lap on the field has 20 points deducted from his/ her total. What to watch for: Watch for riders to position themselves before unleashing their sprint in attempting to gain points. Riders will attack off the front in an attempt to lap the field alone or with other competitors. Lap cards are turned based on the leading rider. As a rider or riders gain a lap on the field, the lap cards are turned based on the next leading rider on the track. Sprint points are awarded, starting with the leader on the track at the time when the bell is rung. The tempo is a variation on the points race in which the first two riders across the line score points. Two points for first and one point for second. At the end of the race the points are totaled and the rider with the most points wins. The points are awarded on every lap or every other lap. This is a points race in which the sprint points progress upward as the race progresses. Often the sprints are each lap and the points awarded correspond to the number shown on the lap cards. The lap cards start at 1 on the first lap and continue to count up as the laps increase. What to watch for:Once again the sprinters try to gain points by winning multiple early laps before tiring while the endurance riders wait for the bigger points on offer later in the race. This is the classic sprint race on the track. The race matches two or three riders against each other over three laps of the track. The first one to cross the line at the finish is the winner. Only the final 200 meters are timed. The race usually starts out slowly with one rider designated to lead out at a minimum of a walking pace. Other riders may voluntarily overtake him. The first two laps usually find the riders maneuvering for their favorite position from which to launch their sprint for the finish line. Riders may block or faint in order to get or maintain their position when not actually sprinting. Once the sprint begins, riders at full speed must limit their side to side movement as they charge to the finish. Once a lead rider enters the sprinter’s lane during the sprint he “controls the lane”. He may not come out of the lane while sprinting and all others must pass him on the outside of this line. What to watch for:Each rider has his or her own strategy for how to win against a particular rider. Some prefer to stay in front of their opponent blocking him or her from getting in front and forcing them to take the long way around in attempting to pass. Watch for the lead rider to block the rear rider and often pin the rider up high against the rail until the last moment before charging for the finish line. Other riders prefer to ride the race from the rear position in an attempt to use the leaders slip stream to sling shot past in the final meters of the sprint. Watch for the race to slow to a crawl in the early laps as each rider attempts to gain the rear position. The Keirin is a massed start sprint event of 1.5 km (6 laps) in length. During the first 3 1/2 laps the riders are paced by a "pacer" or motorcycle. The speed starts slowly at 15 mph and gradually accelerates to 28 mph before the "pacer" pulls off the track, leaving the riders to sprint for the finish. No more than 9 riders may start a Keirin. Riders often qualify for a final through preliminary heats. Keirin races are extremely popular in Japan, where they are the object of heavy legalized gambling. What to watch for: All the riders have the advantage of drafting as even the lead rider gets a draft from the motorcycle. After the first lap riders may move forward or back, and side to side but they may not pass the front wheel of the motor bike while it is still on the track. The Team Sprint matches two teams of three sprinters against each other and against the watch. The Women's Team Sprint is made up of two riders. Each rider of a team takes his or her turn leading the group for a lap at maximum effort. After the completion of lap one the lead rider pulls up and out of the race leaving the rest of the team to continue. After the second rider completes his lap at the front he also pulls up and out of the race allowing the third rider to complete the race. Often this race is run through heats advancing to a final. Sometimes as a time trial where the fastest time wins. What to watch for:A fast, well-coordinated start is important. Riders must get underway as fast as possible. The second and third rider must quickly get positioned closely behind their lead rider in order to gain maximum draft so as to go fast and conserve energy and be as fresh as possible for their own effort at the front. Watch for gaps opening between riders. Compare the effort between teams as they start across the track from each other. The Miss and Out or “Devil take the hindmost” is an elimination race in which the last rider across the finish line every other lap is withdrawn from the race. The tension builds lap after lap as the riders fight for position at the back of the pack. One by one the field is whittled down to the final three riders who then sprint for first second and third place. What to watch for: Watch for crowding at the rear of the pack as riders attempt to move forward to avoid elimination at the line. Some riders will purposely ride at the back to “play the devil” by sprinting at the last second to pass the other riders. Later in the race, the field is smaller but often more tired and the ability to sprint fast is important. One of the most exciting races to watch on the track, the Madison (so named because it originated in Madison Square Garden) is a race consisting of two-rider teams. The riders are required to switch off during the race by means of an exchange. While one member of the team races his partner slowly circles the track above the blue relief line. When they meet, the racer passes his momentum to his partner via a push or “hand sling” before moving up to the relief line to recover for his next effort. Races may be run over a specified number of laps or over a period time. Often, sprints for points are offered as a means of enlivening the action. What to watch for: At first this race can appear to be pure mayhem, but with a little attention and practice you will find it fun to follow. Start by following one team ( they will be wearing identical jerseys ). Keep an eye on the one in the race field and keep track of his partner riding slowly at the relief line. Note how and where the relief rider positions himself so as to receive the push or hand sling exchange. Many teams trying to make exchanges in a crowd can appear confusing but after awhile you will see a pattern of position that allows for the exchanges to occur. Teams are awarded points for sprints, normally 5,3,2 and 1 point for the first four teams across the line. If a team gains a lap on the field they are awarded 20 points. Sprint points are doubled for the final sprint (10,6,4,2). With many teams “jamming” (trying to gain a lap) it is often hard to tell who is leading and who is following. Look for the chief official to occasionally point to the leader as he passes by the judges’ stand to signal to the riders and score-keepers where the head of the race is. Once a rider or team has gained a lap on the field they will be awarded 20 points and the next team or rider pursuing the field will then be considered the “leader on the track”. points are totaled at the end of the event to decide the final placings. Often referred to as the “killermeter” the men’s event is one of the most demanding events on the track. It can be compared to the 400 meter dash in track and field. From a standing start, the cyclist rides as fast as possible for 1 kilometer. Results are easily determined: the fastest time wins. Sponges are placed at the inside edge of the track to prevent competitors from “taking a short cut” through the turns. What to watch for: Riders are often paired against another rider across the track. You can watch their comparative efforts. A hard fast start is essential as well as the ability to pace oneself so as to go close to all out without over doing it, “hitting the wall” and slowing. The mark of class among kilometer riders is their fast start and ability to hold a tight line to the inside of the track. Less experienced riders may drift up, away from the measurement line thus increasing the distance they must cover. With one –hundredths of a second separating gold from silver, time is precious. This event covers four kilometers for men, three for women. Two riders start exactly opposite from each other on the track and literally chase or “pursue” each other around the track. A rider can win the race in one of two ways: by either catching his opponent or by recording the faster time. Times are posted when a rider reaches each half lap. The best riders follow a “schedule”, generally announced track-side by their coach. The event may be run with riders qualifying through heats to a final round or as a time trial in which the rider recording the fastest time overall is declared the winner. What to watch for: This race tests endurance and pacing of the rider’s maximum effort. Watch for a rider to start out slowly, lulling their opponent into a false sense of security, and then come on strong at the end. Some riders will start out fast in an attempt to rattle their opponent and break their confidence, perhaps catching them. Training for this event consists of specialized track training as well as road training. Road racers cross over to this event very well. The Team Pursuit is similar to the Individual Pursuit, except that each team consists of four riders. The racers ride single file, known as a “pace line”, and take turns leading the team around the track. At each turn the lead rider moves up the embankment to slow down, allowing the other three riders to pass underneath, and then drops down the track to the back of the “pace line”. The lead rider is responsible for setting the pace while the other cyclists work inside the draft to keep their speed while recovering. The winner is determined by the time recorded when the third member of the team crosses the finish line. A team is considered caught, when the third member of one team is passed by the third member of the opposing team. What to watch for: See that the start is fast and efficient, allowing all riders to get into position behind the leader quickly without extra effort. A smooth steady pace is important as the following riders must ride close to the rider in front for maximum draft and recovery. Precision bike handling is critical when dropping back onto the pace line. This race is a run as a Points Race with sprints occurring on the designated sprint laps. Points are only awarded to the winner of each sprint. The points for each sprint are determined by turning over a card from the deck of cards and showing this to the riders at the bell lap for each sprint. If the Joker is turned up, the bell is rung and the race becomes a Scratch race with no points awarded and the finish order is determined by the order of finish at the final sprint. What to Watch For: This race leads to speed, but adds the element of mystery. Watch riders go all out for high value sprints and save their energy when deuces are drawn.